Although we love dearly our ability to browse our goats over such a varied bit of land, this style of keeping brings it’s own issues. Meningeal Worm is something I’ve unfortunately become very familiar with. Meningeal worm (Parelaphostrongulus tenuis) is a parasite that live in the brain and spine of whitetail deer. When the eggs are shed, they are often picked up by snails and slugs, which are then ingested by ruminants such as goats, llamas, and sheep. This can cause some serious issues, as the parasite gets “lost,” potentially causing hind end lameness and even paralyzation. My first experiences with Meningeal worm (henceforth referred to as MW) were confusing, because there was almost no information on the parasites, nor the strange symptoms we were experiencing. In the beginning, I actually thought I was looking at two diseases – one that caused hind end lameness, and one that caused skin lesions. It started that very first year the rains really returned. We had been in a drought for so long, I think a lot of us forget just how green and wet it can get. As slugs and snails thrive in the wet, and whitetail deer are everywhere, it’s simply the perfect environment to pick up MW infection – though I didn’t know it at the time. The skin lesions were the true start of my quest. Some of the goats – almost exclusively La Manchas – began to present with awful raw patches of skin. They started as small bare spots, but within a day would be bloody and raw, as if the goat had scraped it ferociously against something. Sometimes the lesions would grow larger, sometimes they would remain small. The vast majority were located on the upper parts of the body, most commonly on the neck. There have been instances of the lesions appearing on the head, shoulders, spine, rump, but rarely below the middle of the goat. After a few days, the lesions healed, and the hair grows back eventually, leaving no trace. I assumed it was a fungal infection to start with – perhaps rain rot or ringworm, though it didn’t exactly fit any of those ailments. When treatments had no effect, I did a skin scraping to look for mites and found nothing. I was left scratching my head in puzzlement over the issue, and the problem was left unsolved. As the season progressed, the skin issues continued, but appeared to have no long term effect on the goats. They’d rub themselves raw, then it would heal with no issues. No one lost their appetite, ran a fever, or became lethargic. I sent the pictures to several fellow goat owners, and even posted them on a couple forums, with no solid diagnosis. It suddenly all made more sense, and I immediately launched into treatment not just for the lame goats, but the ones exhibiting skin. We use extremely high doses of fenbenzadole – 10x the normal dose at least, over several days (minimum five) depending on severity. If the animal is showing neurological symptoms, I include a dose of banamine to act as an anti-inflammatory. Closer inspection of the lesions made it painfully clear it was MW causing these issues – the parasite exits the skin once it becomes lost, and underneath the hair, one can often find “track marks” and holes where it has done so. No one else had described these lesions anywhere, and even a parasite specialist from Texas A&M during a small ruminants veterinary conference had no idea about them, asking us to bring some examples this year if possible. When I tried to bring it up during a goat meeting (that I no longer attend) I was promptly shut down (the rude way in which I was dismissed is one of the reasons I no longer attend, actually). I admit to feeling some vindication when Caroline Lawson wrote an article for the Dairy Goat Journal recently that also described the lesions – the first time since the Onion Creek article that I have seen someone other than myself report these issues in conjunction with MW. Many claim that monthly doses of Ivermectin injectable will act as a preventative, but after trying this method for a season, I was forced to conclude it was not effective for our herd. It’s interesting to note that while both breeds we run can exhibit the hind end lameness, it’s almost exclusively the La Mancha that develop the skin lesions, while the Nigerian Dwarf have only two recorded cases of minor sores. Yet the Nigerian Dwarf are much more likely to go completely down in the hind end and become paralyzed, and also do not respond as well to treatment. Most of the goats treated recovered, though not always 100%. One Nigerian Dwarf doe who had a minor case continues to show some permanent lameness, but it has not inhibited her ability to produce kids or keep up with the herd. Several La Mancha who have had varying degrees of infestation have recovered completely with no sign. A Nigerian Dwarf buck that lost complete control over his hind end recovered through intense treatment and therapy, but can no longer breed due to the weakness of his hind leg still. And unfortunately, three goats – two Nigerian Dwarf does and a La Mancha buck – never recovered the use of their hind legs and were humanely euthanized. Thankfully, this issue is rarely seen among penned goats, but unfortunately it’s one of the risks we personally run here with our style of keeping. There are positives and negatives to any way of keeping, and Meningeal worm remains our largest enemy running our goats the way we do. It’s a risk that, in the end, we have chosen to accept in order to continue to reap the immense benefits of free browsing. The life of a goat owner is never easy, and we all must decide what is best for ourselves and our own animals. Thankfully, the past few years have made me nearly an expert on this parasite, and I hope that this post will help someone else understand what they’re dealing with some day. 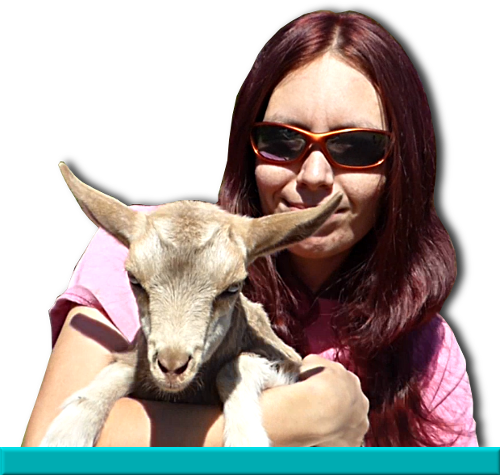 There’s one thing that goat owners learn very quickly: goats hate water. We’ve all seen our goats race for shelter when the rain begins, laughed as they jumped over puddles, and a few of us have even used a squirt gun to discourage inappropriate behavior. And yet, another thing we’ve all learned is that there are always exceptions to the rule. And here at the dairy, we have one extremely notable exception, though our entire herd has become rather more tolerant of water than the average dairy goat. Lime, a young La Mancha goat, has proven herself to be quite the swimmer. I’ll never forget the first time I caught the goats in these antics. As many of you know, our herd browses on a mixture of forest and pasture during most of the year. There are a few ponds, and a rather large creek runs through the property as well. More than once I have had the fortune of catching the herd crossing the creek at a low point, jumping, swimming, and walking through the water rather nonchalantly. So when a couple of goats had turned up recently with hair that showed evidence of being wet, I thought nothing of it. One of my favorite things to do is to take the camera and go out and walk with the goats. I take pictures, shoot video, and just hang out with the girls. It was quite a hot afternoon when I decided to go out – I checked the GPS location of the goats (two of the herd members wear trackers on their collars), finding them relatively close, near a group of ponds. They often rested in this location and I figured I had plenty of time to catch up to them. When I approached, I immediately became concerned – there was a goat in the water! A storm had blown over several trees into the water; the goat must have climbed out for leaves and slipped. I hurried towards the scene, worried that the goat was caught up in branches and unable to get out. As I got closer, I stopped in surprise, realizing that the goat was swimming. I turned the camera on right away, knowing no one would believe it unless I had proof! I hardly believed it myself. What kind of goats are we raising around here? Lime was just a head bobbing about in the water, and she wasn’t alone either – several other goats had joined her in an effort to reach what had to be some really delicious leaves. I moved closer to get a better look, the goats ignoring me as they usually did in these instances, and was just blown away by the antics of these La Mancha. And it’s interesting to note too that it’s only the La Mancha (and primarily Lime) that I catch swimming or wading voluntarily. While the Nigerian Dwarf will cross water if they must, I’ve yet to catch one swimming or wading just to browse. Over that summer and fall, I caught them in the ponds several more times. It still surprises me to see them indulge in this behavior, but I have to say it makes for some great video! As for health concerns, we’ve yet to have any issues stemming directly from the swimming (or drinking of pond water) but precautions should always be taken when it comes to animals around open water.